a stamper q.v. who feeds various shapes of armature discs into automatic machine which stamps out notches; watches proper working of machine and places notched discs in a stack. a press hand q.v. who places machine folded body of tin (see former, body) on block of beading machine and operates lever to form a beaded edge for seaming on top or bottom, etc., or as finish to top; removes box after the bead or rim has been formed. a nail maker q.v. making brads, thin small nails of same thickness but tapering in width from head to point. a draw brads, thin small nails of same thick-ends of fishing rod sections. a drawer q.v. who presses out a metal beading called cantle, used for saddle edging, etc. a draw press hand q.v. making brass caps for electric lamps in a die press. a press hand q.v. operating a power press which stamps out metal cartridge cases. a stamper q.v. operating a power machine which stamps out channel sections from strip metal; may alternatively roll strip between flange rollers. roughly forms points on fish hooks after they have been flattened, by holding under kick stamp. a stamper q.v. operating a power machine which stamps out clock keys or their component parts. a stamper q.v. stamping out clog irons, by operating a power stamping press. nail maker q.v. making cut nails and brads (sprigs) from sheet metal. operates a press stamping machine to cut out from sheet or strip metal or rod, special shapes required for making clog irons, button centres, metal bedstead laths, pens, etc., inserts sheet metal between guides and moves lever with hand or foot to apply power; sometimes specifically designated, e.g., bar and pen cutter, clog iron cutter, lath cutter, linen button cutter, sacking cutter (bedstead laths), shoe tip cutter, tea pot cutter-out. fixes cutting tools, dies, and gauges, and adjusts and repairs automatic rivet cutting machine; supervises efficient running; may also make necessary dies for use in machine, cf. die cutter (230). a cutter q.v. pressing out circular shapes from sheet metal for lids, trays, etc. a stamper q.v. who cuts out pen knife and pocket knife blades with an indentation for the finger nail; may also grind edge in grinding machine. a nail maker q.v. stamping out shoe bills, i.e. small brads used by shoemakers. a nail maker q.v. stamping out sparrow bilk, i.e., small brads used by hoot and shoe makers. cuts off by press or guillotine, fash or flanges left on blades after forging or stamping. marks out steel sheets from templates; stamps, presses or files out. blanks of knives for agricultural cutting implements; cf. machine knife cutter-out (278). operates power press which draws not through dies, presses and cuts off brass or other metal tube to form cartridge cases, electric lamp caps and holders, gas burners, ferrules, etc. ; inserts tube and moves lever with hand or foot to apply power; sometimes specifically designated, e.g., brass drawer, cartridge case drawer, envelope drawer (bullet), gas burner drawer, steel drawer, turbine blade drawer. a press hand q.v. operating a power press which produces a raised design or ornamentation on metal articles. a press hand q.v. who expands or increases internal measurement of sheet metal article or annular forging by placing it under machine press tool. a press hand q.v. who feeds and attends automatic machine making eyelets from sheet brass. sets up, feeds and controls fly press which pierces eye holes in double needle blank; obsolescent, see stamper, needle. a press hand q.v. who operates a power press which stamps and presses out articles of tin, e.g. toys or fancy cake tins, sold in small ware trades. a press hand q.v. who stamps a flange on edge of sheet metal, e.g., on body of tin box or canister for seaming. a fly press worker q.v. stamping out blades of cutting tools and cutlery from sheet steel. a fly press worker q.v. stamping out metal parts of fishing tackle. a press hand q.v. who inserts lining or roving barrel into flyer and closes its hollow tubular arm or leg, by placing in a hand press. a press hand q.v. who feeds and operates machine which rolls or presses bodies of tin boxes, canisters, etc., into required shapes; sometimes more specifically designated, e.g. automatic body former. (ii) a press hand q.v. who feeds and operates a power press which stamps out seamless tin boxes, canisters, etc. a press hand q.v. who operates a power press which forms from blanks, stamped or pressed brass metal parts, in readiness for further embossing, etc. ; cf. brass former (247). a press hand q.v. who presses out parts of cycle frame, e.g., hall head lug, fork crown, seat lug, bottom bracket, hack fork ends. a drawer q.v. operating a power press which shapes reducing parts of gas burner. 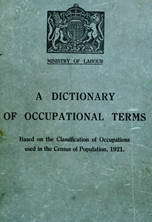 a stamper or fly press worker q.v. who cuts metal washers out of sheet metal. see stamper, hook and eye. a press hand q.v. who makes lagrelle fasteners of steel for connecting ends of machine belting. a fly press worker or general press hand q.v. operating press by pulling lever. general terms for workers on power-driven presses and stamps; duties vary according to machine, but operations usually consist of placing sheet metal or partially formed sheet metal article against gauges in bed of machine and releasing press or stamp by means of hand lever or foot treadle; removes article by hand, if not automatically ejected by machine; does not usually set or adjust machine, which work is done by machine tool setter (211) q.v. ; sometimes specifically designated, e.g. canister making machinist, chain making machinist (cycle), circular machine attendant, nail machine minder, capsule making machinist, safety pin machine hand. a stamper q.v. applying trade marks and other imprints to steel pens. (ii) nail presser; a press hand q.v. who feeds machine press with sheet metal or wire; sometimes specifically designated, e.g. zinc nail machine minder. (ii) see nail machine minder. a press hand q.v. who attaches necks to tin boxes, bottles, canisters, etc., by machine seaming, see seamer; cf. necker-in (262). a stamper q.v. who makes metal notch or disc into which ribs are fitted. a press hand q.v. perforating metal rod, sheet, strip or articles. general term for press hands making petrol cans, including header, cutter-out, former, danger, seamer q.v. a stamper q.v. operating press stamp which pierces holes or holed design in metal, sometimes specifically designated, e.g., brass piercer, curry comb piercer, key piercer, sword hilt piercer. a press hand q.v. operating a semi-automatic power press which pierces holes in pens and also cuts side slits. general terms for workers operating hand or power machine which presses sheet metal, rod or wire into shape in metal dies; usually feeds metal sheet or pieces of metals, previously cut to shape (free cutter), under press between guides and applies power by pulling or kicking lever or by pressing treadle1; may simply feed automatic press by placing blanks in feed hopper or roll of sheet or strip metal on feed roller; removes pressed articles by hand, if these are not automatically ejected by machine; in some cases sets up machine with appropriate dies; sometimes specifically designated, e.g., buckle presser, carriage presser-out (textile), comb presser-out (textile), detonator presser, key presser, nail presser, sinker press hand, steam press worker. a press hand q.v. operating a power press to stamp out spoke holes on rim of wheel. a press hand q.v. operating a press stamp with cutting die which both cuts out of sheet and presses into shape in die. operates fly press for pressing or punching small metal articles; sets sheet metal between guides on bar of machine, pushes round with hand overhead flywheel or heavy ball on horizontal arm to cause cutting die to descent on metal; may pull string, or lever to operate press. a press hand q.v. operating a power press as distinct from a hand or fly press. as for stamper ; sometimes specifically designated, e.g., machine knife puncher, section puncher. a press hand q.v. who pierces and punches steel springs for rolling stock; cf. spring slotter (200). a press hand q.v. feeding flat stamped blanks into a semi-automatic power press which gives them a rounded shape. a press hand q.v. who places tin boxes and iron hollow-ware, which have been previously flanged (see flanger), on holder of power press and operates press to form seams. a seamer q.v. who operates a seaming machine which makes a double turned seam for greater tightness. a cutter q.v. making steel blanks from sheet metal. a press hand q.v. who slits points of steel pens with a fine precision press tool. splits heads of needles on kick stamp in process of making oalyx-eyed needles, a special kind of sewing machine needle with eye at top. a press hand q.v. who presses out from sheet metal, spring cases for pistols, rifles, etc. a drop stamper q.v. who cresses or raises a rib on an edge tool, e.g., hoe. a stamper q.v. who stamps round section wires to triangular section on power stamp for glove maker's or sail maker's needles. general terms for workers operating stamping machines, which cut out or press into shape, sheet metal, wire or rod, under a weighted cutting or shaping die which drops under gravity, or is thrust down sharply by power, as distinguished from the more slowly moving press; feeds sheet metal, etc., under stamp between guides and operates stamp by pressing foot treadle or pulling or kicking strap or lever; may also set up stamping machine by inserting appropriate cutting or shaping dies; sometimes specifically designated, e.g., buckle stamper, brass stamper, chair nail stamper, coin stamper, eye stamper (needles), ferrule stamper, gun metal stamper, hilt stamper, key stamper, needle stamper, odd stamper, split ring stamper, table blade stamper, zinc sash bar stamper. a stamper q.v. who stamps and presses coins, medallions, or badges between engraved dies in a power stamping press. a stamper q.v. operating a drop fl gravity stamp, as distinct from a machine in which the stamping die is thrust down by power, to stamp out dish covers, pan handles, ladles, etc. ; cf. drop stamper (190). feeds with wire and strip or sheet metal an automatic press stamp which makes hooks and eyes. a stamper q.v. operating a stamping machine by kicking a lever or pressing his foot .against a strap. sets up, feeds and controls machine which automatically flattens out centre of wires (the length of two needles) and impresses two oval dents close together on both surfaces thus flattened, in preparation for eyeing, see eyer; or completely shapes head and eye of needle in one operation. a stamper q.v. who shapes brass sheet blank into cup or basin in first operation of forming brass shell cases up to 6 inches. a stamper q.v. operating a stamping press in which the die both presses and pierces the metal, e.g., badges. a nail maker q.v. who sets up and sometimes operates a power press which makes a cut nail called a tingle. a press hand q.v. cutting out teeth from saw blanks; sometimes specifically designated, e.g. hack saw toother. a press hand q.v. who turns over edge or flange, usually of blank of a metal article. as for clock key maker.